Ladies and gentlemen…the diva is back! That’s right, Mariah Carey is back with her 14th studio album, “Me. I Am Mariah…The Elusive Chanteuse.” With a hefty title such as this, I couldn’t wait to get my hands on the tracks and take a listen to make sure the diva herself lived up to the high expectations of this album. It’s no secret—I’ve been a Mariah Carey fan since her “Daydream” days. I was one of those little girls who would sing the lyrics to “Fantasy” and pretend I was the leading lady starring in the music video. “Me. 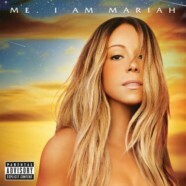 I Am Mariah…The Elusive Chanteuse” is a very diverse album as it features Carey singing gospel, R&B, hip hop and pop. Although the album’s title doesn’t lead you to think so, the album is filled with historic collaborations and a sound for every mood you may ever feel in life. The album opens up with a very somber tune, “Cry” which is a gospel song covered by piano sounds. “Faded” is a song that will get you into the mood to go clubbing with your crew. One of the many things I absolutely love about Mariah Carey is her ability to involve other well-known artists in her projects. For this album, she collaborated with artists such as Fabolous, Nas, Miguel, R Kelly, Mary J. Blige and more. Carey reprises two of her songs from previous album “Memoirs of an Imperfect Angel” in “It’s a Wrap” featuring Mary J. Blige and “Betcha Gon’ Know” featuring R. Kelly. “It’s a Wrap” was a dope song on the last album- however certain songs shouldn’t be reprised and this is one of them. Carey didn’t incorporate any new lyrics for this song and instead Mary J. Blige sings Carey’s second verse from the original song and in typical R. Kelly fashion, he sings about a misinterpreted affair for “Betcha Gon’ Know” which is nothing new. I’m a huge fan of old school rap, so I was excited to see there would be a collaboration with Nas who is an undisputed champ of rap and is featured on “Dedicated,” which simply tells about how hard work and dedication can make any relationship work. Another favorite song on the album is “The Art of Letting Go” which sincerely tells how letting go is hard but you will find peace once you finally do let go. The song’s title was also originally supposed to have been the title for the album as well. Because Mariah Carey has steadily branded herself as a diva and that’s what fans know about her, this album is another example of her creative branding. Carey went so far for this album that she even included artwork she drew when she was a young diva in the album’s packaging. Overall, this was a good album. I would have preferred to have seen a different title for the album but the music makes up for it and true Mariah Carey fans will certainly appreciate the album as it adds to her diva persona we all know and love.